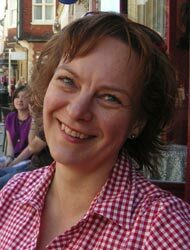 Anu Korhonen researches and teaches at the University of Turku and is one of the most renowned cultural historians of the younger generation. She gained prominence particularly due to her research on body and gender history of Early Modern England. Korhonen has also worked on methods and theories of cultural studies. In her work, she combines a profound knowledge of historical material with incisive analytical ability and methodical reflection. Before assuming her fellowship in Mainz, she was a research fellow at the Academy of Finland at the University of Helsinki and a member of its Department of World Cultures.